Find out more about the local clubs and organizations in the Town of Sedgewick and how you can get involved. Battle River Art Club (BRAC) is a vibrant group of artists from Flagstaff County who gather together every Monday night to work on art. Several workshops and courses are also held throughout the year. The club runs from September to April and holds an Annual Art Show at the end of April. BRAC donated a mural to the Town for the Centennial Celebrations. 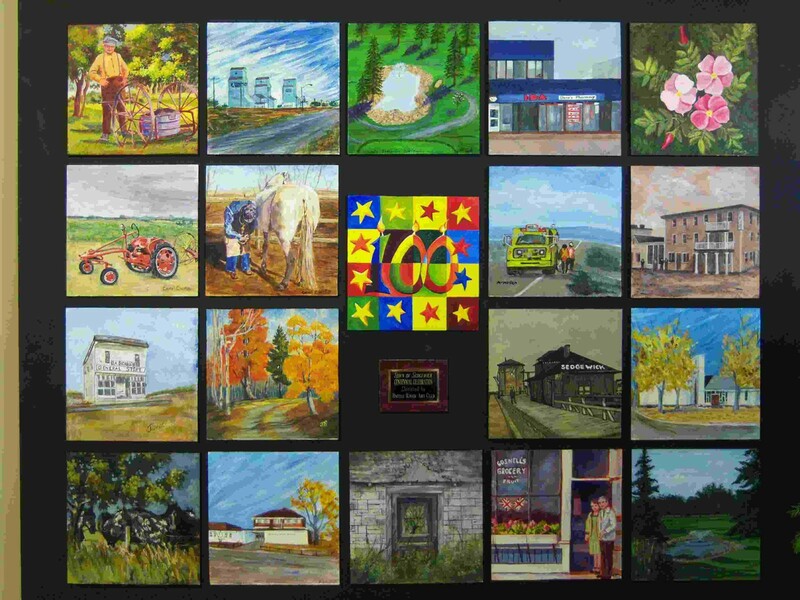 Drop into the Town office to see the mural or click here. Meetings for the Iron Creek Flying Club(COPA Flight 157) are held the 2nd Thursday of each month at 7:30 PM at the Airport Terminal Building. Monthly meetings are held on the first Tuesday of every month at 8:00 PM in the Community Hall. All membership inquiries can be directed to Debra Swainson 780-384-2255. Learn more about the Royal Canadian Legion in the Alberta-NWT. To read more about Canadian Veterans and the History of the Legion, visit Canadian Veterans. The Sedgewick Lions Club hosts a number of community events and fundraisers for the community.